Notes contacts to Outlook Express converter exports multiple contacts from Lotus Notes names.nsf file into Outlook Express address book. The software allows converting all contacts with associated details. Also, it will convert multiple email addresses and contact numbers from the NSF file contacts. This Lotus Notes contacts conversion tool exports all the contacts into CSV file format. After conversion, it will create OE-contacts.csv file with all the fields saved in columns and data within the cells. This resultant CSV file can further be imported within Outlook Express. As you add a names.nsf file, software quickly performs scanning of the files. After this, it will load all the contacts and generate an instant preview of contacts. You can view the information related to business address, business contact information, personal information, briefcase and other basic details. While you export or convert contacts from Lotus Notes to Outlook Express, the software will prompt you to select fields. You can check or uncheck the contacts fields and software will export only selected contacts within the CSV file. A separate column will be related to each field you select. By default, all the fields will get exported. After scanning contact files, the software list all its contacts alphabetically from A to Z. You can click and expand each alphabet and view the listed contacts in it. This will help you search and find any specific contact from whole large list of contacts easily. The Notes contacts to Outlook Express migrator offers a very simple and easy to comprehend steps of converting and saving Lotus Notes contacts into Outlook Express. You do not require any technical specialities to use this program. You can simply perform the conversion by opening names.nsf file, scanning contacts, exporting them to CSV and finally importing the output CSV into Outlook Express. Which version of Lotus Notes does the software support? 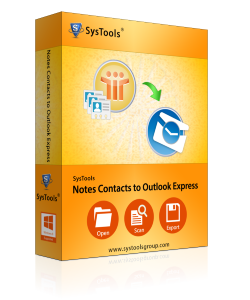 Notes contacts to Outlook express tool is compatible with all versions of IBM Notes including 9.0 and all below versions. Can this tool convert multiple contacts of an address book at a time? Yes, this software can convert any number of contacts into Outlook Express address book format. There is no such limitation on the number of Lotus Notes contacts to be converted. How much time does the software take for conversion? This software responds very quickly and takes very less amount of time to convert Lotus Notes contacts. Do I need to install Lotus Notes on my machine for conversion? Yes, Lotus Notes should be installed and configured properly on the conversion machine otherwise error messages like; "Lotus Notes is not installed/configured properly" can be encountered. Does the tool require Outlook Express installation for conversion? I have Windows 7 OS configured machine. Do I need to have Outlook Express installed on my machine before I proceed with the conversion of NSF contacts to Outlook Express? This software will convert names.nsf to a CSV file without needing Outlook Express environment. Further,on a machine having Outlook Express installed you can import this output CSV file into the client to open converted contacts in it. How to import CSV file into Outlook Express? Go to File >> Import >> Other Address Book. Address Book Import wizard will be open. Select "Text File (Comma Separated Values)" option. Click on "Browse" and choose CSV file to import. Change mapping of the "Text Field" and "Address Book Field" or leave as it is accordingly. CSV file of converted contacts will be imported into Outlook Express. I was surprised by the tools simple 3 way steps of conversion. I just had to select and open my names.nsf file and convert it after it gets loaded. Simply impressed by the performance, all my expectations were successfully met with; which was a great thing. I just loved the selective field export facility of the tool. It was great to find out that our preference and choice is being considered before making the conversion. Not converting all contacts saved time of conversion as well as sorting out desired contacts later on.